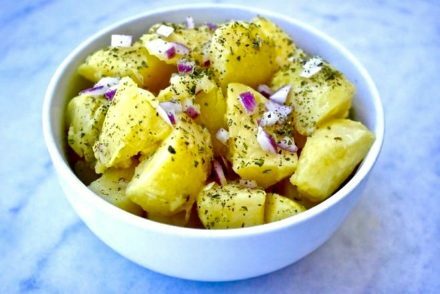 Today I am sharing a favorite, traditional Greek recipe. Another lathero. These days, here in Greece we have been getting very little sleep, what with following all the developments taking place with our economy, so I cook dishes that are very easy, almost requiring no recipe. Just vegetables cooked with olive oil and tomato, that is what a lathero is. This one is called arakas latheros, translated as peas cooked in olive oil. 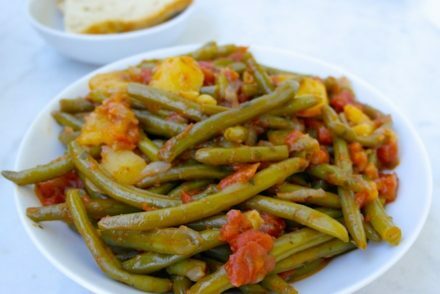 Not only is it easy to make, but it is also a comfort food: cooked vegetables in a rich olive oil-tomato sauce, accompanied with tangy feta and good bread to dip in the yummy juices. I feel peas are an underestimated food, usually served on the side plainly boiled with a lump of butter on them. However, in Greek cuisine we cook them in olive oil and tomato, along with dill. We also add carrots and potatoes-(today I added only carrots as I did not have any potatoes). This meal of course, is accompanied by feta and bread. Again this is a vegetable based main meal that is characteristic of the Greek diet, not a side dish. So in essence you fulfill almost all your vegetable needs of the day, in just one meal. Peas although a starchy vegetable, are a good source of protein. Peas are actually considered a legume. Apart from protein it is a great source of fiber, beta-carotene, vitamin C, folate, but also a good source of iron and calcium. 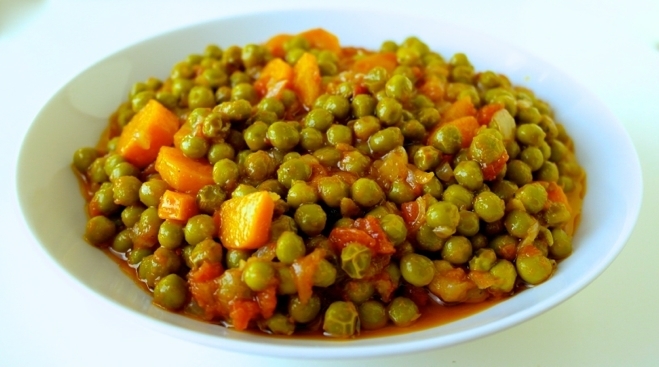 In addition peas have high antioxidant activity due to the presence of beta-carotene, lutein and zeaxanthin. This dish, as with all lathera is consumed at room temperature and tastes better the next day. Heat olive oil in a medium sized pot. Sauté onions until soft. Add carrots and potatoes and sauté 3-4 minutes more. Add peas and heat and mix until all peas are covered in the olive oil. Add the tomato, dill and pepper. Add enough hot water so that the peas are covered just a bit (about ¼ cup). Mix well and bring to a boil. Then lower heat and simmer for 30-45 minutes, until peas are soft and water is gone-they should only be left with the olive oil. Serve at room temperature with feta and bread. Add salt as needed. One of our favorite main dishes!Filled with wonderful nutrients! We buy frozen petite peas, cook them the same way, and serve them as lunch or dinner every other week. Tender and succulant! Definitely! Frozen peas are fine to use and I use them often. Hi, Elena. This sounds lovely. My problem is that I have never like the taste of dill. Is there a different herb that would work well with this dish please ? Many thanks for your help. Dill and peas is the classic-traditional combo. But you can add parsley instead. I was never much of a fan of dill either. But with peas, this is one of the only dishes I love that uses dill. I was wondering what your opinion of a low carb diet is? They seem to be getting a lot of good press at the moment, but the world’s best diet – Greek – isn’t low carb, so I get a bit confused with it all!! The Greek diet is actually a moderate carb diet. Greeks do not eat as much pasta and most dishes are vegetable based. Sticking to mostly whole-grain bread is a good idea. Thanks Trudee, Try not to go below 1/4 cup for every pound of vegetables. Please could you setle an argument? I am married to an Athenian who insists that aracas are not peas ie bizelia (in Greek) . Peas or aracas it’s still a great dish!! Just made this dish tonight. I’ve been eyeing it for a while and it’s delicious! Very easy too. I’ll be bringing some for my lunch tomorrow. Thanks for the recipe! I have made this dish several times and every time I am amazed as to how tasty and satisfying this dish is. if you use can tomatoes, do you drain them or use the liquid? Hi Debby, I use the liquid as well. Thank you for sharing Lindi. 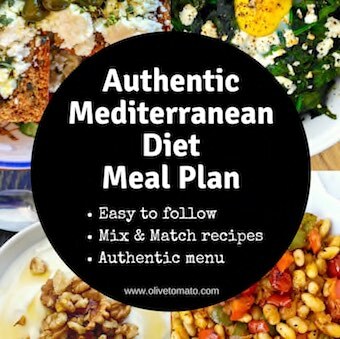 Yes, the Greek/Mediterranean diet is simple yet colorful and inexpensive. Thank you so much for this quick, tasty recipe! I’m so happy that I found your site – I plan to make many more of your recipes from now on. This was delicious! My 13 year old son devoured it and said it was the best new recipe I’ve made in a long time. Huge complement! Hi, The recipe does not mention peas, only lentils 🙂 Do I just substitute the lentils for peas? Or am I reading it wrong? Hi Anesta. Apologies, we have been updating our recipe format and must have put the lentil recipe instead. It is corrected now. I just stumbled upon your site and I’m so glad! This is the first dish I’ve tried. Made it today for lunch and it was soooo delicious. And it was easy! 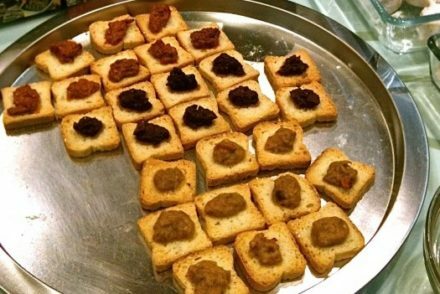 Thank you so much for these recipes and for sharing your knowledge. This was delicious! We have made several of your recipes and loved them all, but simple peas and carrots with all that fresh dill and feta might be my new favorite. Thank you very much for everything you take the time to provide on this site! It is wonderful. Thank you Tabitha! I appreciate it!